There are 75 Assisted Living Facilities in the Covina area, with 7 in Covina and 68 nearby. The average cost of assisted living in Covina is $3,195 per month. This is lower than the national median of $3,346. Cheaper nearby regions include Azusa with an average starting cost of $2,500. To help you with your search, browse the 181 reviews below for assisted living facilities in Covina. On average, consumers rate assisted living in Covina 4.2 out of 5 stars. Better rated regions include West Covina with an average rating of 4.3 out of 5 stars. Caring.com has helped thousands of families find high-quality senior care. To speak with one of our Family Advisors about assisted living options and costs in Covina, call (855) 863-8283. St. Paul'S Home For The Elderly, Inc.
Covina is a suburb in the San Gabriel Valley region of Los Angeles, California. Once a sea of orange and grapefruit vineyards, the former "home of the greatest oranges in the world" is now a modest bedroom community. The city itself has played host to a number of on-location shoots for movies and TV. Covina's population is 48,000, 14.6 percent of whom are seniors over 65. To care for these seniors as they age, Covina boasts 43 different assisted living communities. The State of California regulates assisted living facilities through the Department of Social Services. Residential care facilities for the elderly and continuing care retirement communities receive evaluations and inspections through the Senior Care Licensing Program. The weather in Covina is characterized by hot summers and mild winters. July high temperatures average around 93 degrees Fahrenheit and January lows average a temperate 45 degrees. The city is far enough inland that Pacific breezes do not provide cooling relief; seniors who are sensitive to high heat may be uncomfortable in the summer. Violent crime rates in Covina are about a quarter lower than the national average, while property crimes are higher. Seniors are still advised to use caution, especially when venturing into Los Angeles proper. The cost of living in Covina is 173.5, compared against a baseline of 100 for the U.S. Seniors will notice that grocery and health care costs are close to the national average. Housing, however, is nearly three times the average in the country, which may affect assisted living costs. Covina residents 60 and over, as well as those with a qualifying disability, are eligible for reduced rates from the Los Angeles County Metropolitan Transportation Authority and the City of Los Angeles Department of Transportation (LADOT). These bus and light rail lines serve the entire Los Angeles metro area. The city of Covina also provides door-to-door transport around the city for seniors and the disabled. Covina, as a suburb of Los Angeles, is a member of the AARP Network of Age-Friendly Communities, meaning that its elected leadership “has made the commitment to actively work toward making their town, city or county a great place for people of all ages,” according to AARP. The Covina area is home to world-class medical facilities, including the Inter-Community Hospital and Kindred Hospital San Gabriel Valley, in the event of medical emergencies or illness. Assisted Living costs in Covina start around $3,195 per month on average, while the nationwide average cost of assisted living is $4,000 per month, according to the latest figures from Genworth’s Cost of Care Survey. It’s important to note that assisted living rates in Covina and the surrounding suburbs can vary widely based on factors such as location, the level of care needed, apartment size and the types of amenities offered at each community. 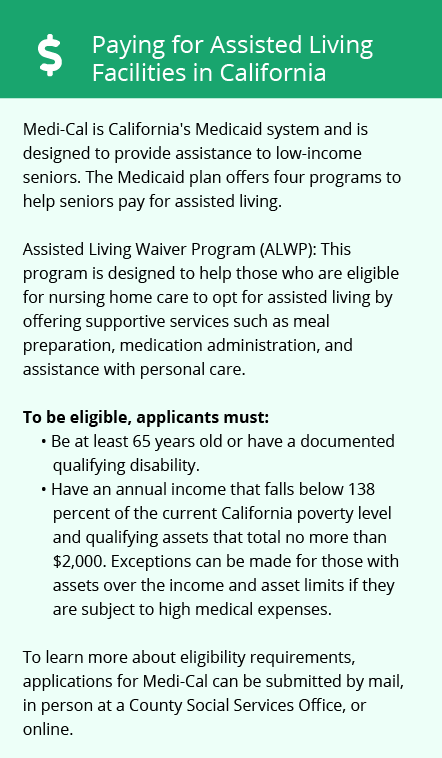 Seniors in Covina, as in all of California, may be eligible for the Assisted Living Waiver which is a Home and Community-Based Services program. 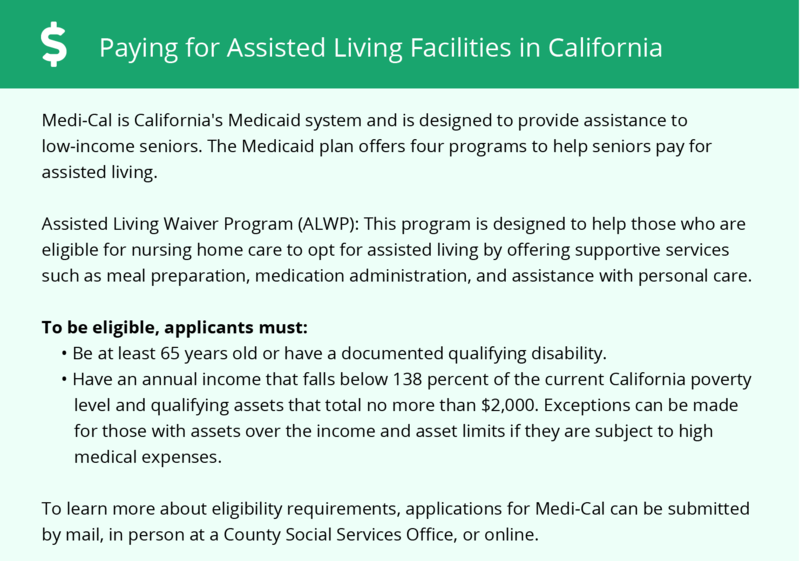 It's open to all seniors who qualify in the State of California and was created by legislation that directed the California Department of Health Care Services to help accommodate those who need financial assistance with senior living. Covina and the surrounding area are home to numerous government agencies and non-profit organizations offering help for seniors searching for or currently residing in an assisted living community. These organizations can also provide assistance in a number of other eldercare services such as geriatric care management, elder law advice, estate planning, finding home care and health and wellness programs. To see a list of free assisted living resources in Covina, please visit our Assisted Living in California page. Covina-area assisted living communities must adhere to the comprehensive set of state laws and regulations that all assisted living communities in California are required to follow. Visit our Assisted Living in California page for more information about these laws.